It probably won’t surprise anyone that we love our sweets in Michigan. This means that there is an abundance of candy shops to be explored, scattered across the state. From historic shops that have been around since the early 1900s, to chocolate gardens and legendary fudge, Michigan can satisfy your sweet tooth. Check out these 10 great shops in Michigan. Head on up to Clawson for a candy shop experience so good it was actually featured on Food Network. Part of its 50 great candy shops in the United States listing, Doc Sweets' delivers a staggering array of candy, going from the Abba Zabba to the Zotz, and featuring candy going as far back as the early 1900s. They'll even chocolate coat certain insects, so whether your tastes are plain vanilla or the wildest exotic you can picture, chances are Doc Sweets has your prescription. Candy fans know that more is more, and less is less. So, when candy buying time comes around, “bulk” is a good way to shop. That's where Taylor's The Bulk Store comes in, and offers sales on a monthly basis. Featuring candy priced per pound, getting as much or as little of the good stuff as you want is right on hand. Wrapped or unwrapped, chocolate or fruit-flavored, it's all right here, and you can even order online. The best part about Sanders Candy, just outside of Detroit, is that it not only allows you to shop for candy, but also see it being made. Sanders Candy offers regular factory tours, allowing visitors to see just what it is that goes into the candy that they can subsequently take home with them. Those who'd rather just get to the candy, meanwhile, will be happy to note that there are several locations of Sanders Candy dealerships throughout the state, so a little advance legwork will let you find one near your intended destination. Rockford—not too far from Grand Rapids—is home to one of the biggest names in candy shop in Michigan: Sweetland Chocolates and Coffee. This shop focuses on the “Made in Michigan” concept, offering up a kind of milk chocolate seafoam as one of its leading offerings. Featuring several others, including homemade turtles, truffles, and less esoteric fare, Sweetland has been a big part of West Michigan's candy cravings for almost a century. There's even online ordering if you're not in the area, and two stores in Grand Rapids proper round out the slate of possibilities. Rocky's Eastern Market—sometimes amplified to include the term “Historic” in there—offers a mammoth slate of candy and nut options as well as various specialty cooking products. Rocky's has been in the Russo family for three generations now, which fairly-well proves it's in for the long haul of providing candy. Those in the Coloma area will want to get a slice of the Chocolate Garden's offerings, as it's taken a staggering quantity of accolades in its time. With appearances on Food Network, Fine Living TV, and the Travel Channel, as well as the honor of “best chocolatier in America” from America's Best Online, it's clear these are a cut above the standard. Homemade truffles are the real draw here, as they're made by a wholly proprietary process that results in an outer shell that is neither hard nor waxy, the Chocolate Garden asserts. Another shop focused on “Made in Michigan,” Gilbert Chocolates has been making chocolates in Jackson for the last 110 years, reports note. With custom assortments of truffles, gift packages, bagged gourmet chocolates and a host of other possibilities on hand—as well as online ordering—it's a safe bet that the Jackson store will have all the chocolate most anyone can ask for. Looking for great candy in the Upper Peninsula? Well, you've actually got a few choices, but one of the best around is Doncker's in Marquette, a place that knows candy in a big way. 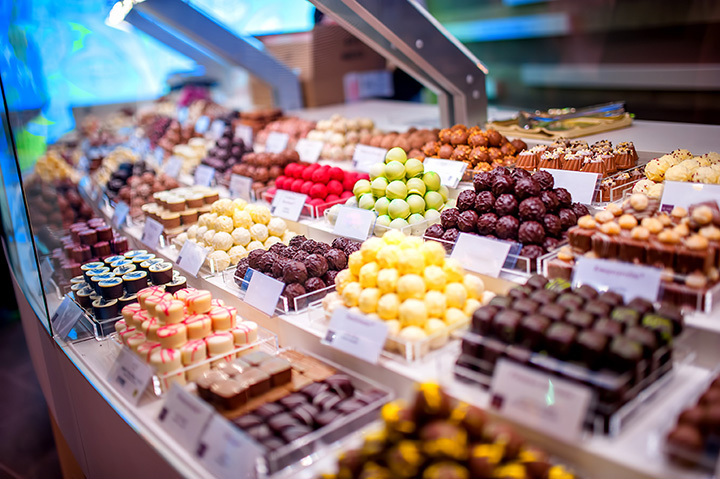 Offering bars, barks, rolls, and the signature Sea Salt Caramel, Doncker's shoppers will be able to get hands on a staggering array of high-end chocolate. And if all that is too much for you, stop and have an actual meal. Doncker's comes with its own restaurant. Due warning: There is no way to conclusively answer the question of “where is the best fudge on Mackinac Island” without starting—and winning—a fight. With 29 flavors available, and the top slot in TripAdvisors' reckoning of reviews, JoAnn's Fudge has to be a top competitor for the slot. Featuring regular fudge, holiday-specific fudge, and even non-fudge sweets as well like dessert sauces and saltwater taffy, it's a safe bet that a sweet tooth will fall to its very knees under the force of all that sugar.